An unattended lighted candle started a fire early Tuesday that killed an elderly woman in her Levittown home and sent her adult son to the hospital after he tried in vain to rescue her, a fire official said. 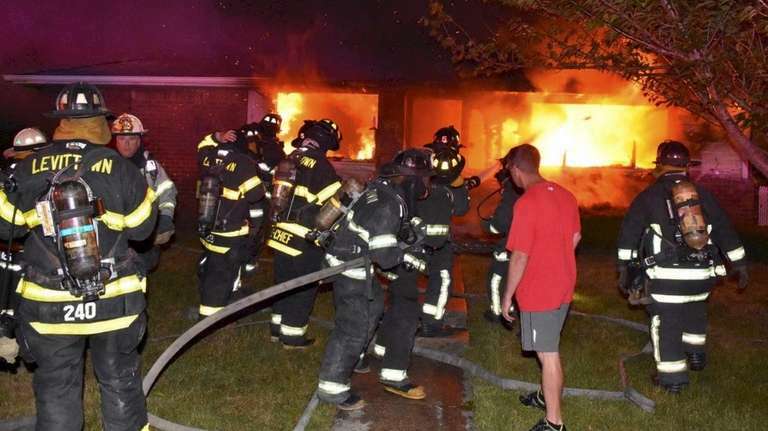 Firefighters from the Levittown department encountered heavy smoke upon arriving at the house on Wadsworth Avenue at 4:15 a.m., Nassau County Fire Marshal James Hickman said. They found the unidentified woman dead in a back bedroom, Hickman said. She had been mostly bedridden, he said. The woman's son tried to rescue her but was unable to because of the flames, Hickman said. "He made a valiant effort to save his mother," the fire marshal said. Hickman said it was unknown how the candle, which was in the basement, ignited the fire. The fire collapsed the front right corner of the first floor of the home, he said. Neighbors said the woman and her late husband, who was a retired FDNY firefighter, moved into the neighborhood in the 1960s and raised four children. She lived in the house with the son, who is in his 40s and took care of her with the help of an aide, the neighbors said. Danny Calabria, who lives next door, said his wife woke him up because she heard yelling and smelled smoke. Calabria ran to the house, where the son was shouting that his mother was still inside. Calabria and the woman's son tried to enter through a side door but couldn't because the smoke was too intense. Calabria's wife called 911. The son was taken to the hospital by ambulance, neighbors said. Hickman said the man has since been released, but the extent of his injuries was unknown. Calabria said he and his family had gone to the woman's home for barbecues in the past and described her as dedicated to her children. "She was a sweetheart of a woman," Calabria said.